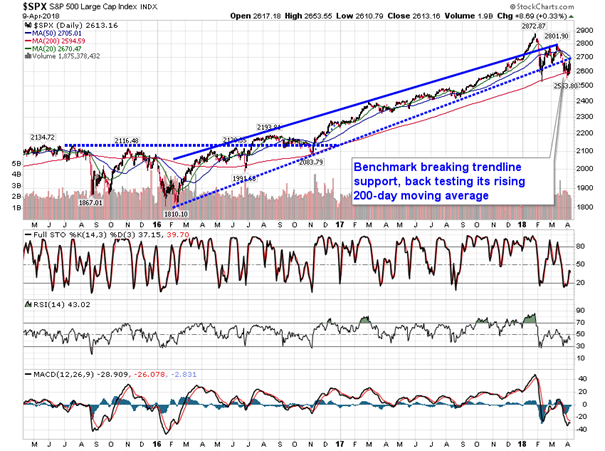 Benchmarks coiling between 20-day moving average resistance and 200-day moving average support. *** Stocks highlighted are for information purposes only and should not be considered as advice to purchase or to sell mentioned securities. 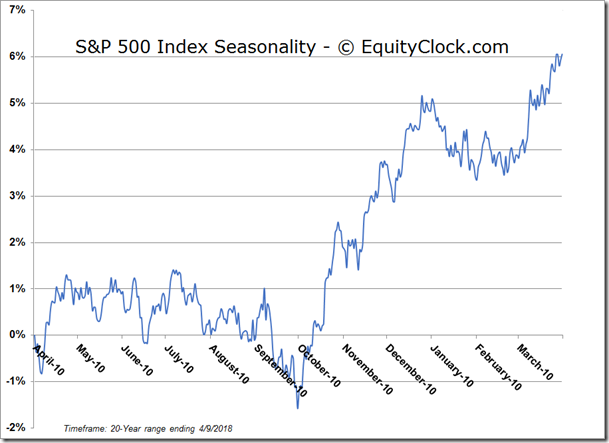 As always, the use of technical and fundamental analysis is encouraged in order to fine tune entry and exit points to average seasonal trends. Stocks rallied out of the gate on Monday, but failed to hold the strong gains into the close. The S&P 500 Index ended the session higher by a third of one percent, clawing back some of Friday’s loss. 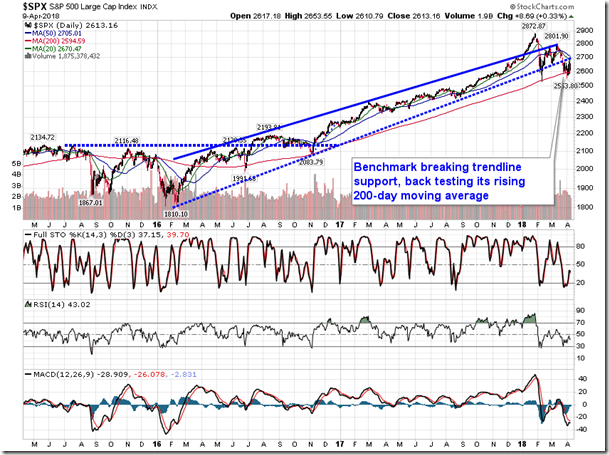 Turning immediately to the hourly chart of the large-cap index, the benchmark is holding above previous short-term trendline resistance, a hurdle that maintained a series of lower-highs and lower-lows since early March. 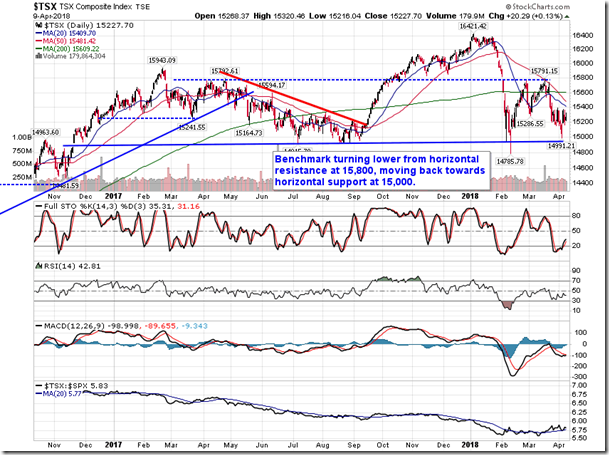 A new short-term trend is trying to emerge with a higher low now apparent above the April 2nd low of 2553. Horizontal resistance is overhead around 2672, a break of which projects upside potential to the February and March highs around 2800. 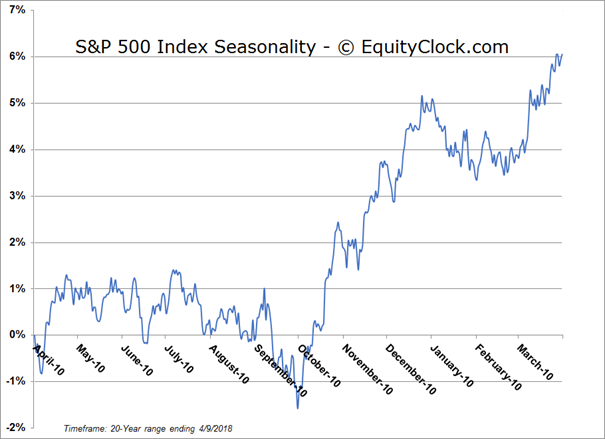 The days ahead brings an onslaught of earnings reports, which should provide a much needed distraction from the headlines that have dominated the tape. Stepping back to a daily look at the major benchmarks in the US, prices remain bound between rising 200-day moving average support and declining 20-day moving average resistance. 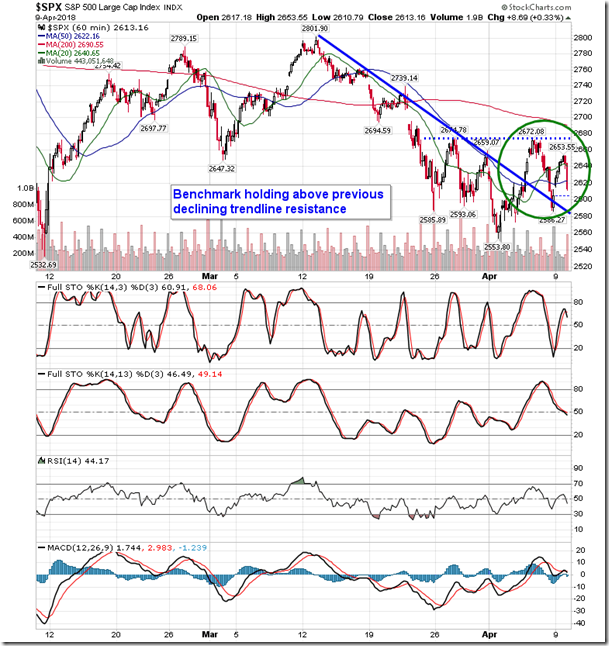 The range is narrowing and prices are coiling, setting up for an explosive move in the direction of the break. The daily pattern is very intriguing because while horizontal support has remained solid around the February lows, the lower high below the January peak suggests an intermediate trend change. 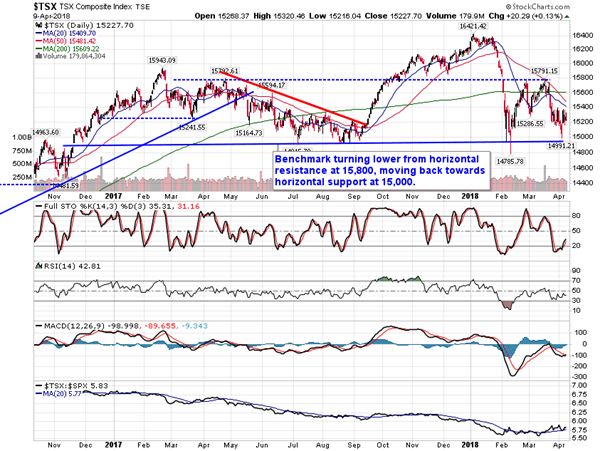 It might be ideal to see a slight breach of the February low in order to generate more of a capitulation in stocks, washing out loose hands and setting the stage for the next move higher. 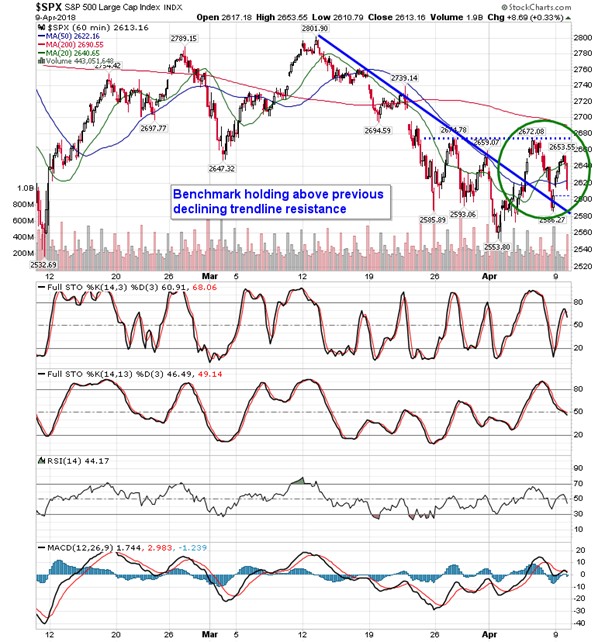 The break of the coil around the 200-day moving average could easily be to the downside, despite what could potentially be a bullish setup on the shorter term look. Economic data remains strong and forward earnings per share for S&P 500 companies are on an upward trajectory, both boding well for gains in equity prices. While economic data remains strong in the US, including shipping activity, one gauge of global activity may raise concerns. 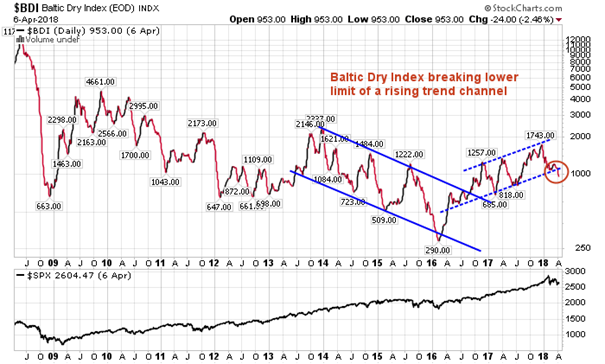 The Baltic Dry Index, which provides a gauge of the cost of moving major raw materials by sea, has fallen by over 45% since peaking in December. The pullback became apparent from the upper limit of a rising trend channel, but that rising span has now been broken to the downside. However, it would take a move below 818, or another 14% below present levels, to bring an end to the intermediate trend of higher-highs and higher-lows. Obviously the outcome of international trade will factor prominently on the longer-term direction of this economic indicator. 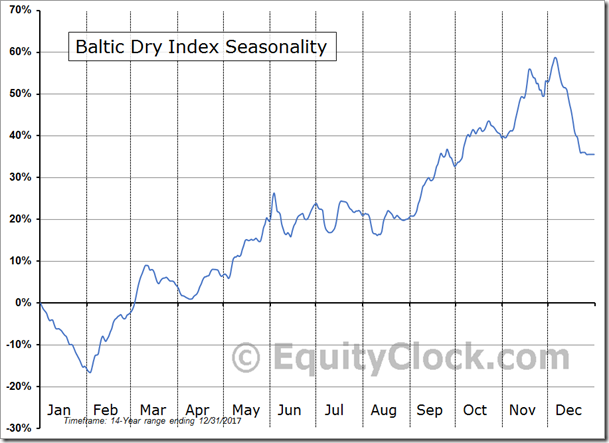 Seasonally, the Baltic Dry Index typically sees its best gains for the year between August and December and then again in the Spring. While the former period certainly showed this average result, we have yet to see a floor in the index at a time when manufacturing and industrial production are typically strong. Greater investment in the US following recently passed tax cuts may be a factor as the US “hogs” the strength in this segment of the economy, weighing on international activity. 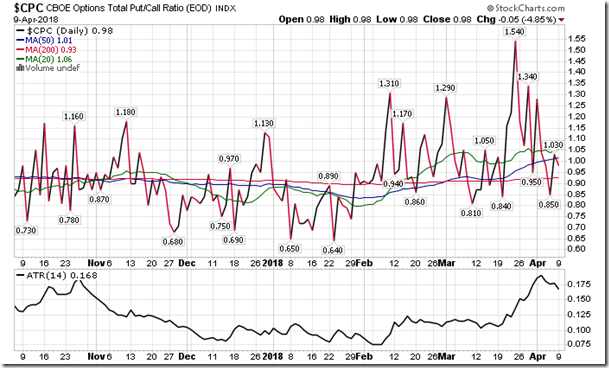 Sentiment on Monday, as gauged by the put-call ratio, ended close to neutral at 0.98. 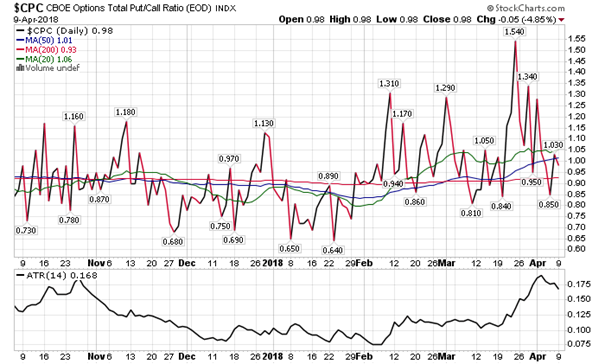 Stocks becoming vulnerable as bond prices perk up. Energy sector realizes an abrupt rejection from its declining 200-day moving average as period of seasonal strength nears an end. Stocks chart new closing highs as investors remain risk-on. Earnings season continues with reports from Procter & Gamble, Coca-Cola, Verizon, Centene, Texas Instruments, Stryker, United Technologies, and Canadian Pacific. 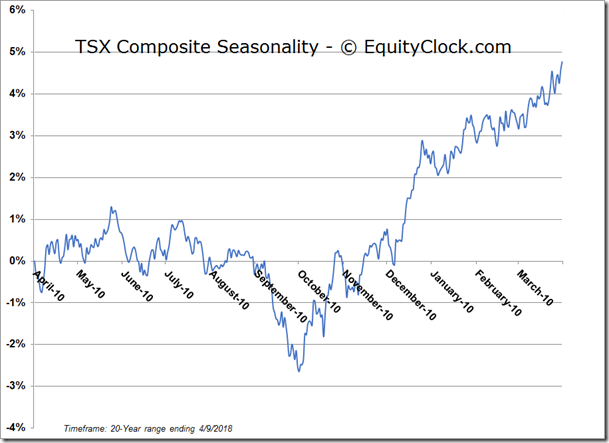 Find the seasonal charts here. The underperforming trend of the industrial sector looks to have concluded. Jon Vialoux is a registered Associate Portfolio Manager at CastleMoore Inc. Comments and opinions offered in this website are for information only. They should not be considered as advice to purchase or to sell mentioned securities. Data offered in this report is believed to be accurate, but is not guaranteed. 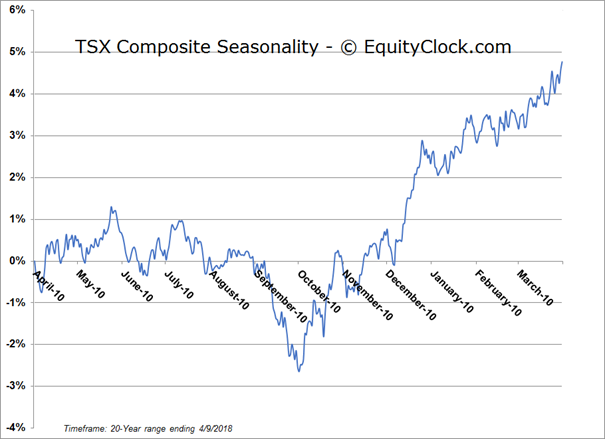 Equity Clock provides free seasonal investment research and analysis on equity, commodity, bond, and futures markets. 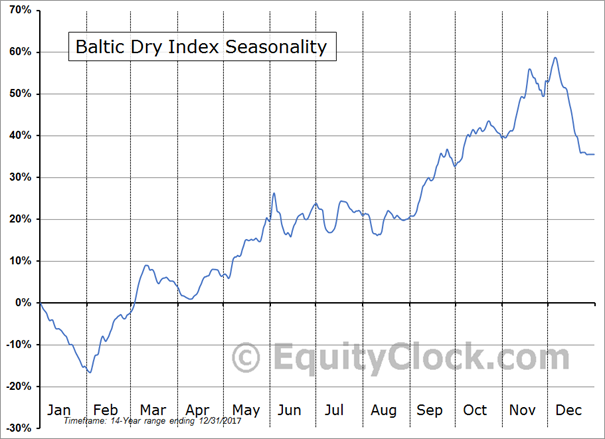 EquityClock.com offers the largest source of seasonal investment profiles on the internet.